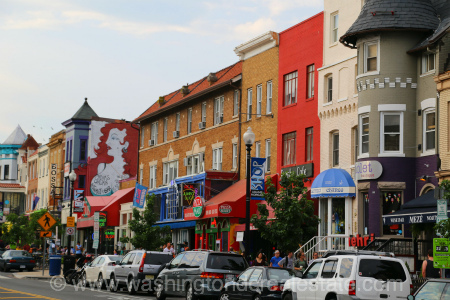 Adams Morgan is a bustling neighborhood in the northwest quadrant of Washington, DC known for its nightlife and cultural diversity. Named for DC's first segregated schools, the Thomas P. Morgan Elementary School, and the John Quincy Adams Elementary School, Adams Morgan is located just two miles from the White House at the crossroads of 18th Street and Columbia Road. Read more about Adams Morgan real estate. The community has undergone substantial revitalization in the last 20 years and features a number of renovated 19th and 20th century row houses. Newly constructed condos and upscale lofts are also becoming a fixture. In addition to serving as one of the District's hotspots for music, dancing, and clubs, Adams Morgan also is celebrated for the largest display of expressive art in the city. Transportation options include the Woodley Park/Zoo and Columbia Heights metro stations, both an approximate 15 minute walk. Adams Morgan is bounded by Connecticut Avenue, Columbia Road, Calvert Street, Adams Mill Road, Harvard Street, 16th Street, U Street, and Florida Avenue.